I recently wrote an article where I conducted a review of salary cap efficiency by team, across the NHL. In it, I argued that how efficiently a team manages its salary cap it just as important as how much they are able to spend on it. Having had some time to reflect after writing that piece, I wanted to dig a bit deeper into the subject and expand on my previous analysis. In this article I will borrow from my prior work to try to determine the common salary cap management characteristics found in the leagues’ strongest teams. By the end I will introduce the ‘Financial Frontier’ – a concept that represents the threshold that only the ‘contenders’ in NHL are able to cross. Ultimately, my goal is to illustrate the components of financial management (within hockey operations) that are required for a team to be successful in this league. Before getting to the frontier, let’s do a quick review of the components that make it up: (i) total cap dollars spent and (ii) salary cap efficiency. Prior to my initial piece on this subject, Dimitri Filipovic over at Sportsnet wrote an excellent article where he dug into the impact of total cap dollars spent on playoff success. 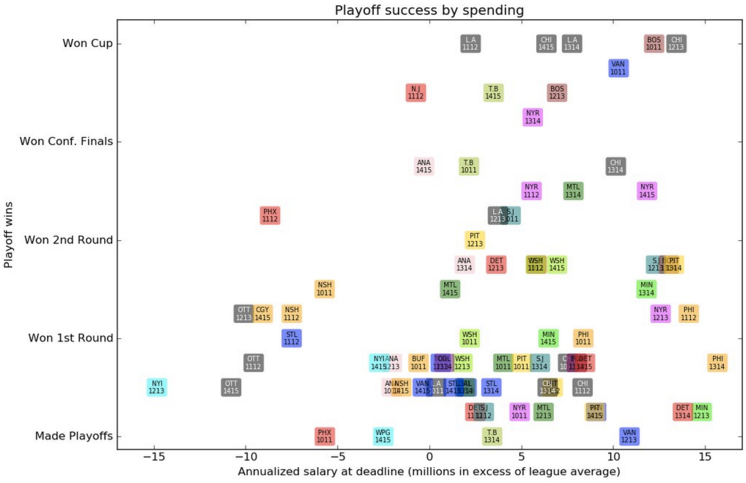 In it, he successfully showed that the vast majority of cup or conference finals-winning teams spent at or above the league average against their salary cap. He also provided the following table, highlighting the seeming lack of success for teams that spend below the league average. As you can see from the two graphics above, there are very few teams in the league that have won a conference final/the Stanley Cup while spending at or around the league average. Of the sample shown, the only teams to do so while being within +/- $5M of average were the 2010-11 & 2014-2015 Tampa Bay Lightning, the 2011-12 LA Kings, the 2011-12 New Jersey Devils, and the 2014-15 Anaheim Ducks (all found in the top-middle section of the first chart). In the end, Dimitri’s analysis demonstrates that spending more (or at least having that option) is going to provide an advantage – which I think we all intuitively agree with. Now, let’s look at the cap-efficiency side of the equation. Following this analysis by Dimitri, I wrote an article of my own where I reviewed the salary cap ‘efficiency’ of all teams in the league in 2014-2015. To do, I used a methodology that I originally outlined here, where I compared the salary caps of the 2014-2015 Chicago Blackhawks and the 2014-2015 Toronto Maple Leafs. In short, my prior methodology was based on a bottom-up analysis of all individual players on each team, their scores on the Goals Above Replacement (GAR) metric, and converting that metric to each player’s estimated ‘win value’ based on the free-agent market price of GAR in a given season. If you want to see the full detail behind the approach, I encourage you to check out the additional detail in those articles. Although we can conclude from this work that both of spending power and spending efficiency are important factors to succeeding – we can’t necessarily make the conclusion that either one of these elements is more important. As a result, let’s get into the main point of this article, where will look at how these two figures interact with each other, and how we can use that to define the characteristics of ‘competitive’ salary cap management. Looking at a few specific examples on this chart and comparing them to ‘commonly’ held views of each team can also help support the conclusions of this analysis. For example, the only teams who made the playoffs but were not at or past the Frontier were VAN, CGY and MTL. As most hockey fans are aware of – Vancouver and Calgary were largely considered fortunate to have made it into the playoffs at all, with many seeing Calgary as only making the second round by virtue of having played the Canucks in the first. Likewise for Montreal – as this past season’s results demonstrate – they were somewhat of an anomaly in 2014-2015, given the unbelievable value contributed by Carey Price being the major reason they were contending like they did. Similarly, San Jose*, Dallas and LA’s strong positions at or past the Frontier make them look like outliers for having not made the playoffs. Lo and behold, all three were major contenders this year, all of whom had legitimate chances at making the Conference finals this year, if not the cup – and all doing so with relatively minor changes to their rosters. *(Note: My salary cap data source may not properly account for all of San Jose’s total cap spend in 2014-2015, as it may be missing (at least) some cap-buyout dollars, at ~$5M for SJS. San Jose’s total spend was likely closer to high 60s. However, this error should not change the outcome of this analysis). In the end – I don’t think anyone will be too surprised by the fact that it is important both to have the flexibility to be able to spend to the cap, as well as to use those dollars as wisely as possible. Overall, it should be becoming clear there are a wide range of new financial dimensions that (I expect) teams have been placing increasing weight on when making decisions. For fans whose teams are performing poorly in the Frontier chart above, the silver lining is that many of those teams (Florida, Toronto, Buffalo) are well on their way to improving both their salary cap and roster situations towards becoming contenders once again. On the other hand, for fans of teams that look OK in the chart above, but who haven’t been aggressively managing their cap commitments (NY Rangers, Detroit) – you may want to brace yourselves for some less than pleasant years to come.